But I'm a New Solopreneur. Do I REALLY Need CRM Software? Home » Blog » But I’m a New Solopreneur. 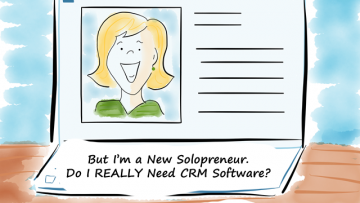 Do I REALLY Need CRM Software? Customer Relationship Management software (CRM) is usually associated with smooth talking sales guys from BigFirm Inc. These guys use state of the art systems that costs thousands of dollars every year and require months of training just to even turn them on! Luckily, the landscape of CRM software has evolved, and while those sales guys from big companies and expensive software are still kicking around, CRMs are now affordable, and accessible to the solopreneur. In fact, research has shown that CRMs deliver an ROI of $8.71 for every dollar spent. With figures like these it’s worth investigating if CRM software is a fit for your business. But what is it exactly? And why should you bother? Put simply, a CRM is a software program that helps you to manage your business relationships. I bet you’ve already got one going on, and you don’t even know it. Do you have a spreadsheet filled with data about your customers and leads? That’s a homemade CRM right there, without any fancy automation. Or maybe you use Google Apps to keep track of your contacts? Voila! Another CRM, with a few more possible automation features than the humble spreadsheet. So why should you bother? Sure, your spreadsheet or Google Apps setup is probably working well for you… for now. But your business is booming! You’ve got meetings, client phone calls, deals to close, marketing campaigns to run, and so many people to keep track of. Sometimes it feels a bit out of your control, but you manage it… just. CRMs can help you get a handle on your customer relationships. As you know, nurturing relationships with your customers is the most effective way to gain their loyalty and retain their business. But as it’s a challenge to build meaningful business relationships. Thanks to the internet you now have access to an unprecedented amount of personal information about your clientele. But if you have to Google every customer you’ve got, you’re going to be Googling for months. Luckily, many CRMs offer social media tracking, so if you look up a customer contact in the system, you can see their social media profiles. You can then have a quick look through these profiles before an important meeting and see if there is anything you can use as a touch point to create rapport. Not only that, you should use social media channels to interact with your customers. Freelance Digital Collaborator Bernie J. Mitchell, for example, has been using Nimble to nurture his business relationships with great success. 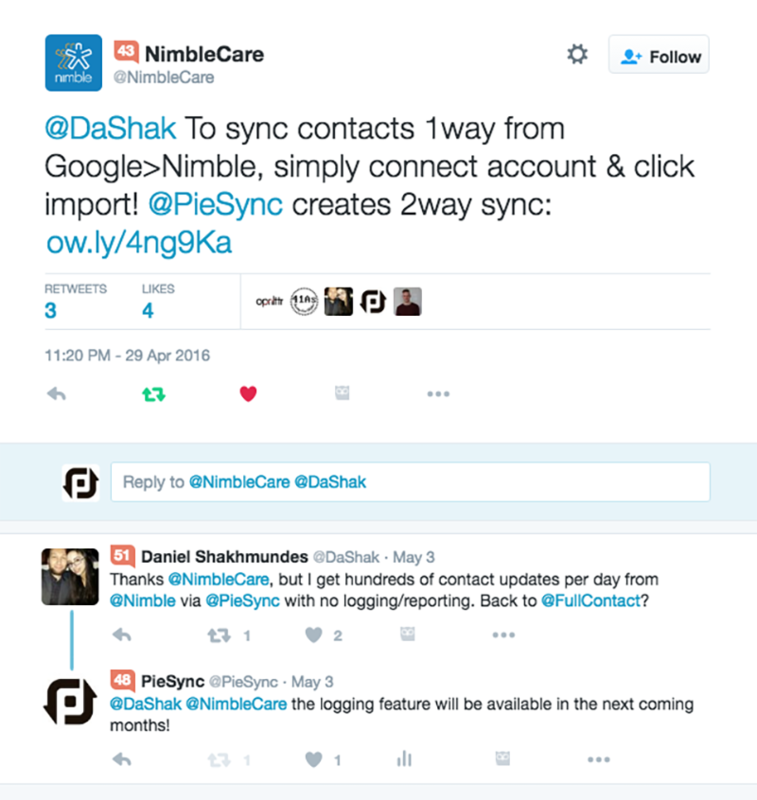 “Nimble helped me get a grip on my network. I love connecting with people and connecting people, and Nimble allowed me to build relationships with those people in the place most useful to them. There’s no point emailing someone who likes to communicate in Twitter, you have to be where they are most comfortable,” Mitchell told me. The take-home message is that if you’re able to be where your customers are, whether it’s shooting a couple of emails or tweeting them, you’re able to nurture better relationships with them. With recent reports finding that there is a 15% increase in churn if you fail to respond to customers on their chosen social media channels, you can’t afford to ignore social media interaction. And the best way to track all of these interactions? A CRM. CRMs often have functions to capture social media interactions. Here’s an example of social media messages collected in one inbox. You can also respond to the messages from within this one window. How simple is that? Executive Coaching Expert, Phillip Colins from Action and Theory, told me that he uses his CRM to remind him to keep in contact with his prospects. So Should You Invest Your Time in a CRM? While you know all about email personalization, you haven’t really gone beyond the standard “Hello (first name).” So everyone gets the same emails at the same time, regardless if they are brand new customers or have been with you for years. CRMs can help you to segment customers based on when they first started doing business with you, account activity, or purchase history. You can then send your customers personalized offers and communications tailored to where they are in your sales pipeline. Somehow not every single one of your contacts is making it into your database. Or your contacts are making it into your database but are entered incorrectly. This is bad news. A recent study from Experian Data Quality, found that 60% of businesses say incomplete or missing data is the most common data problem they face. With a CRM app and a couple of integrations, you can immediately capture new data, and slash your data entry to almost zero, which means your data quality will rise. You know the true meaning of crunching numbers. You’ve bookmarked every pie chart and graph-making software on the internet, and you dread report time at the end of the month. Most CRMs have report functions, and some automatically generate your report when you need it. The internet can be a bit like a slick talking salesman. 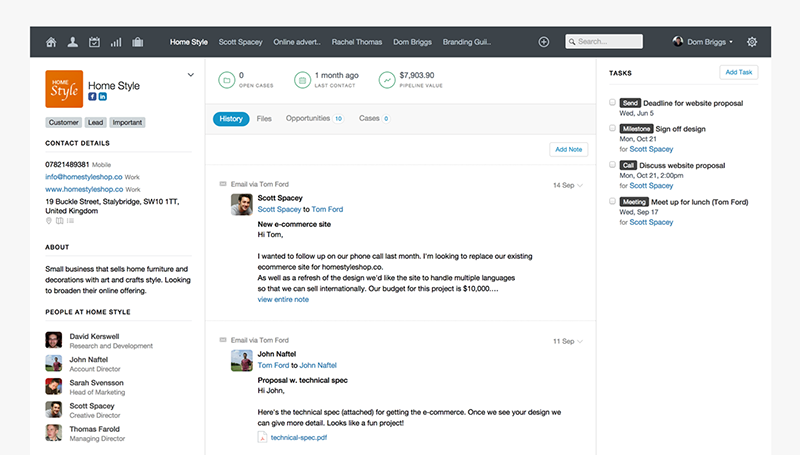 It’ll try to sell you the biggest, brightest CRM software with all the bells and whistles, (and a hefty price to boot). But what you might find is you end up with a very expensive e-Rolodex, because you don’t need all the fancy features at all. Make sure you find a CRM that does business the way YOU want (and need) to do business. Don’t do a bunch of research and start reverse engineering your needs based on the cool things a CRM can do. Make sure you can migrate your existing data into your CRM (many have functions to import excel spreadsheets and Google contacts). This is a lifesaver. You really don’t want to be re-entering in each and every single contact you’ve got. Make sure your chosen CRM is intuitive and easy to use. Automation is critical to your CRM success. These are the things that will separate your CRM from a simple data entry tool. How can you create invoices and quotes? How can I find out if prospects have responded? Can your CRM provide you with a 360-degree view of your customer so you’re prepared for your important calls? 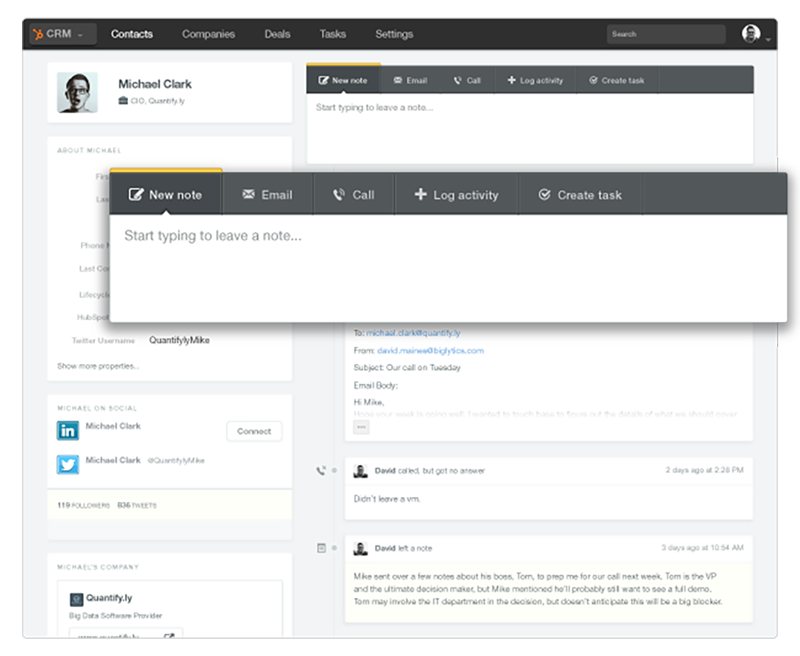 Insightly is a contact management, opportunity, and pipeline management as well as task management solution for small businesses. Tags: to quickly categorize contacts. Subnavigation: centralized communication direct on contact card. Social Networks: Automatic Social Network Integration. Custom Fields: organize your contacts exactly as you see fit. Pricing: FREE for up to 2 users. HubSpot CRM This humble sales-focused CRM is so simple to use, you’ll be navigating it like a pro within an hour. It’s ease of use and the price tag (free! ), make it an ideal starter CRM. 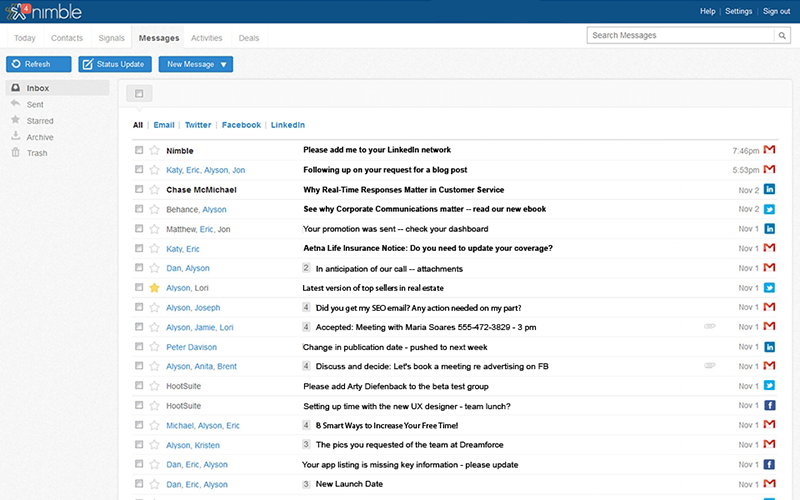 Capsule CRM is an easy online CRM. 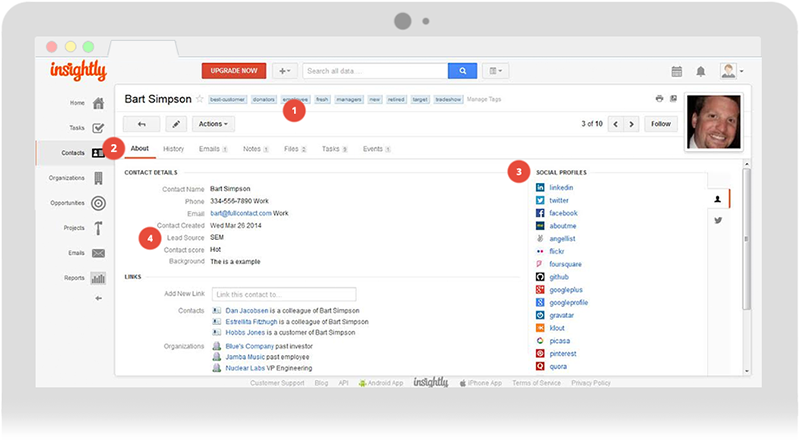 You can manage contacts, leads, customers, vendors and more. It lets you track bids, deals, proposals, and it links emails back to contacts. 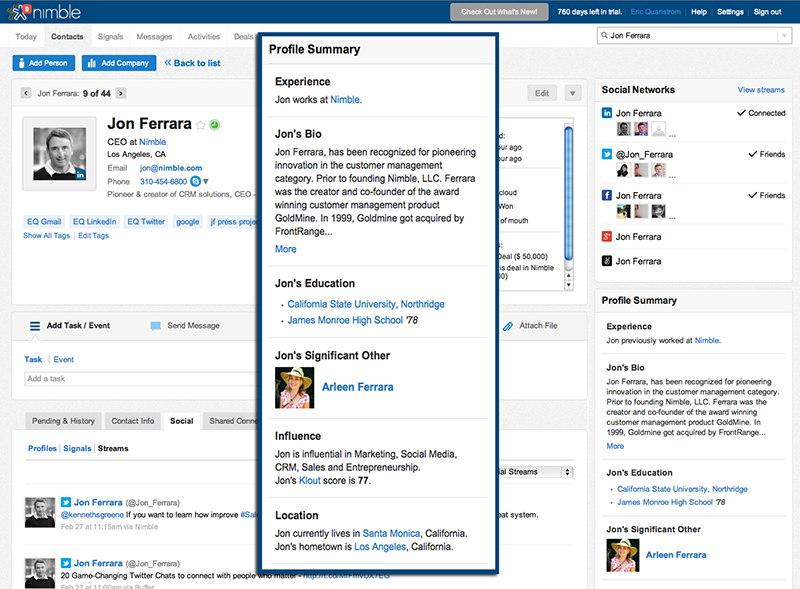 Nimble focuses on the importance of social relationships. It’s also a great resource that allows you to align your CRM with all of your social media accounts. With Nimble, you can manage your contacts, activities, and calendar, information from social channels, emails and messages, and deals. Pricing: $15 per user per month. I hope by now you see how useful a CRM can be for your business—no matter where you are on the journey. Even with a free starter CRM, you’ll be better organized and better able to serve your customers and clients. And that’s what it’s all about, isn’t it? Your turn. Do you use CRM software? If not, how are you tracking everything? Leave a comment below! Another CRM that I am using is vTiger. There is a hosted version, of you can self host it. It can integrate with email services such as Mailchimp, and a great FOSS marketing automation package called Mautic. I can define my own fields, create forms for my CMS (Joomla), and make workflows so that we can have the system automate business processes. vTiger is also another great choice. I agree that it’s important that CRMs can integrate with other cloud apps, such as MailChimp. It’s equally important the CRM works for YOU not the other way around! Thanks for sharing wonderful information. It is really valuable information. I work for small business. Such information really helpful for small business owners. Thanks Anika, I’m glad you found this information valuable. I’m really happy to share information so you can make informed decisions for your small business.